I didn’t need or have the money for another “gym membership”! And I had hired Personal Trainers in the past… with poor, short-term results. So when I wandered onto your doorstep 11 months ago, I was very skeptical and resistant. During my life, I’ve heard just about every pitch imaginable. Besides, my fiancée had just purchased an expensive treadmill so, along with my projected use of it and my membership at Gold’s Gym, I felt that I didn’t need your services. But deep inside, I knew I was kidding myself. I had not been achieving the kinds of results that I wanted and needed in health and fitness since I was in my early 20s. In my youth, it was much easier! 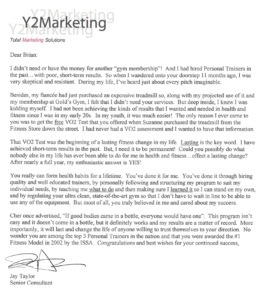 The only reason I ever came to you was to get the free VO2 Test that you offered when Suzanne purchased the treadmill from the Fitness Store down the street. 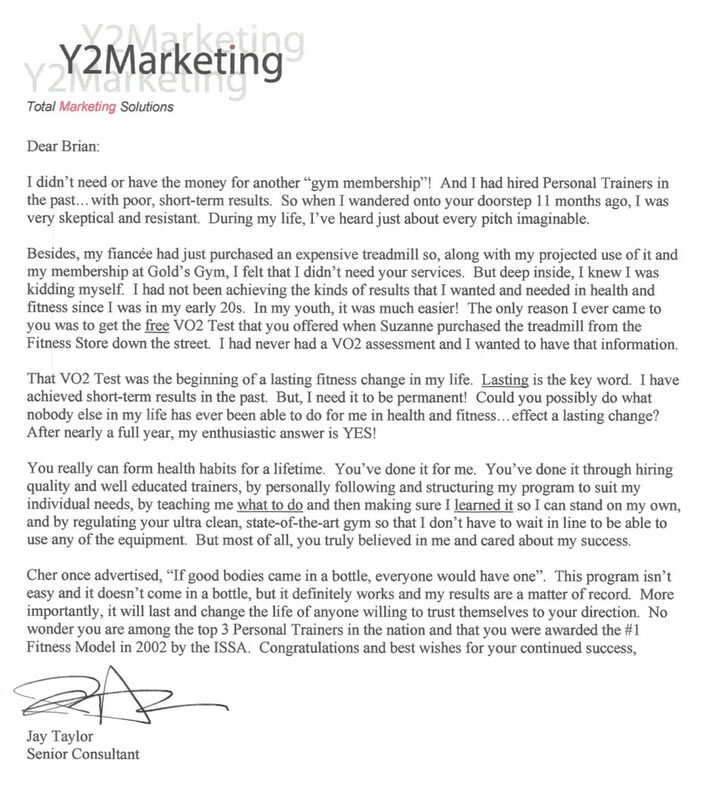 I had never had a VO2 assessment and I wanted to have that information. That VO2 Test was the beginning of a lasting fitness change in my life. Lasting is the key word. I have achieved short-term results in the past. But, I need it to be permanent! Could you possibly do what nobody else in my life has ever been able to do for me in health and fitness… effect a lasting change? After nearly a full year, my enthusiastic answer is YES! You really can form health habits for a lifetime. You’ve done it for me. You’ve done it through hiring quality and well educated trainers, by personally following and structuring my program to suit my individual needs, by teaching me what to do and then making sure I learned it so I can stand on my own, and by regulating your ultra clean, state-of-the-art gym so that I don’t have to wait in line to be able to use any of the equipment. But most of all, you truly believed in me and cared about my success. Cher once advertised, “If good bodies came in a bottle, everyone would have one”. This program isn’t easy and it doesn’t come in a bottle, but it definitely works and my results are a matter of record. More importantly, it will last and change the life of anyone willing to trust themselves to your direction. No wonder you are among the top 3 Personal Trainers in the nation and that you were awarded the #1 Fitness Trainer by the ISSA.